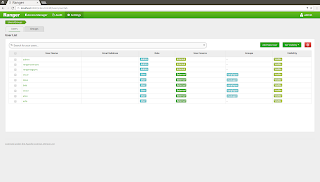 The previous post [on Colm's blog] covered how to install the Apache Ranger Admin service. The Apache Ranger Admin UI supports creating authorization policies for various Big Data components, by giving users and/or groups permissions on resources. This means that we need to import users/groups into the Apache Ranger Admin service from some backend service in order to create meaningful authorization policies. Apache Ranger supports syncing users into the Admin service from both unix and ldap. 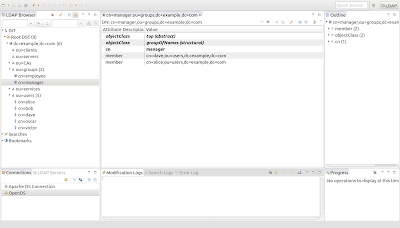 In this post, we'll look at syncing in users and groups from an OpenDS LDAP backend. Now you can run the setup script via "sudo ./setup.sh". The Apache Ranger Usersync service can be started via "sudo ./ranger-usersync-services.sh start". After 1 minute (see SYNC_INTERVAL above), it should successfully copy the users/groups from the OpenDS backend into the Apache Ranger Admin. Open a browser and go to "http://localhost:6080", and click on "Settings" and then "Users/Groups". You should see the users and groups synced successfully from OpenDS. Colm O hEigeartaigh is an ASF member and committer of Apache Santuario, Apache Webservices and Apache CXF. Colm has an expert knowledge of computer security, and holds a doctorate in cryptography. At Talend, he is a software architect in the Application Integration division. In addition to his other Apache leadership positions, he leads development on the Apache WSS4j subproject.